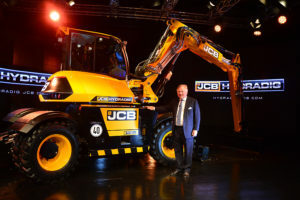 JCB achieved underlying earnings of £214 million during 2015 despite difficult market conditions in most developing markets around the world and slower than expected growth in North American and European markets. Overall, the global market for construction equipment dropped by 14% during 2015. Market conditions in the first half of 2016 remain fragile with the exception of India, where there has been a return to growth after four successive years of market contraction. Earnings for full-year 2015 on an EBITDA basis were £214 million (2014: £294 million) before one-off restructuring costs of £10 million (2014: £11 million). Sales turnover was £2.34 billion against £2.51 billion the previous year, and total machine sales during 2015 were 59,844 (2014: 64,028).